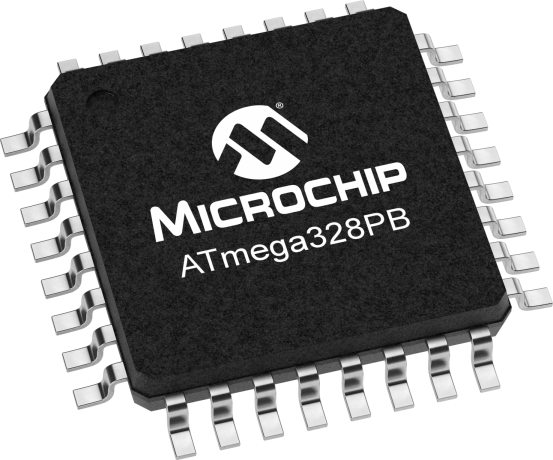 The high-performance Microchip's ATmega328PB is an 8-bit AVR® RISC-based microcontroller (MCU) with picoPower® technology. It combines 32kB ISP Flash memory with read-while-write capabilities, 1kB EEPROM, 2kB SRAM, 27 general purpose I/O lines, 32 general purpose working registers, five flexible timer/counters with compare modes, internal and external interrupts, two USARTs with wake-up on start of transmission, two byte-oriented 2-wire serial interfaces, two SPI serial ports, 8-channel 10-bit A/D converter, programmable watchdog timer with internal oscillator, a unique serial number and six software selectable power saving modes. The device operates between 1.8-5.5 volts. The ATmega328PB is the first 8-bit AVR MCU to feature the QTouch® Peripheral Touch Controller (PTC), which acquires signals in order to detect touch on capacitive sensors, and supports both self- and mutual-capacitance sensors. The PTC is supported by the QTouch Composer development tool (QTouch Library project builder and QTouch Analyzer). It provides a faster and less complex capacitive touch implementation in any application. The ATmega328PB supports 24 buttons in self-capacitance mode, or up to 144 buttons in mutual-capacitance mode. Mixing and matching mutual-and self-capacitance sensors is possible. Only one pin is required per electrode and no external components are required, delivering savings on the BOM cost compared to competing solutions.